Sixteen-year-old Jack gets drunk and is in the wrong place at the wrong time. He is kidnapped. He escapes, narrowly. The only person he tells is his best friend, Conner. When they arrive in London as planned for summer break, a stranger hands Jack a pair of glasses. Through the lenses, he sees another world called Marbury. There is war in Marbury. It is a desolate and murderous place where Jack is responsible for the survival of two younger boys. Conner is there, too. But he’s trying to kill them. Meanwhile, Jack is falling in love with an English girl, and afraid he’s losing his mind. Conner tells Jack it’s going to be okay. But it’s not. Andrew Smith has written his most beautiful and personal novel yet, as he explores the nightmarish outer limits of what trauma can do to our bodies and our minds. Andrew Smith has written his most beautiful and personal novel yet, as he explores the nightmarish outer limits of what trauma can do to our bodies and our minds. 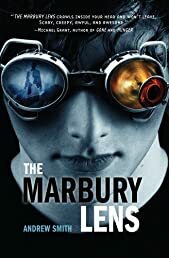 On a number of levels, The Marbury Lens is an attempt on my part to reconnect with many of the experiences I went through as a teenager. At that time, I was quite a fan of horror stories. In particular, I think I read every book Stephen King put out as soon as they'd hit the shelves. So, I always wanted to write something that would scare the daylights out of me -- if I could somehow be transported back in time to those years. More than that, like Jack Whitmore, the narrator of The Marbury Lens, I also went through some tough and terrifying experiences as a teen. So the novel is, in many ways, very personal, which, I think, helps pull readers in to the very dark worlds Jack unwillingly travels through.